Interesting info, I had figured that depending on the angle that the contact point of the posts would sequence around as it turns, but had not thought of a single point on the ball. Guess that makes sense as the assembly takes up load and twists against the next part. Goes to show how much technology is behind apparently simple parts. Given the dirty environment, no grease makes sense, but in thier catalog they describe the need for periodic thin coats of oil on the inside ends of the chain to keep it from grinding the ends of the links. Also they say to swap the chains end for end periodically to even wear. I'd love to find a maintenance/operation manual for one of these, closest I have is one from 1932. Funny how maintenance procedures change over time and environment. Several years ago the show Dirty Jobs did an episode on the NASA crawler, used to move rockets and shuttles, which was made by Marion. They were putting in new layers of super thick grease on the track wheels. It ran in a much cleaner environment, with a much bigger maintenance budget. 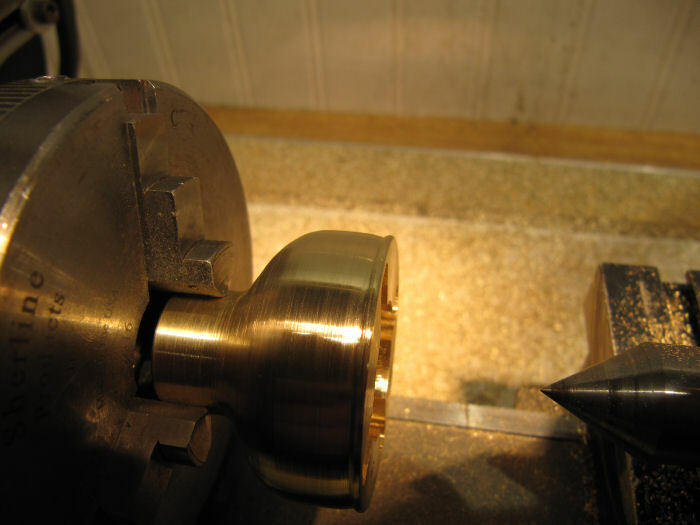 Back in the shop today, started in shaping the outsides of the U-joint shells. First up is one of the shorter outside parts, turned the narrow end down to size, then roughed in the curved sections to get close to the final shape. After a couple of shallow smoothing cuts it was finished off and faired with a flat file on the outside curve and a quarter round file for the inside portion of the curve. Then it was turned around, and the final shaping done on the large end to finish the curve and form the lip at the end. It quickly became apparent why they wanted to have at least one end be able to be slid down the shaft - otherwise there is no way to assemble the shaft onto the tracks, it would take a very steep pitch angle on the track end to make it slip into place. I still am not sure why they used the seperate dog clutch piece, which I assume has a keyway of some sort, at least a pin it rides on, and did not just put a key for the upper end to slide on. But, they did it that way, so I will copy that until my time machine is ready! 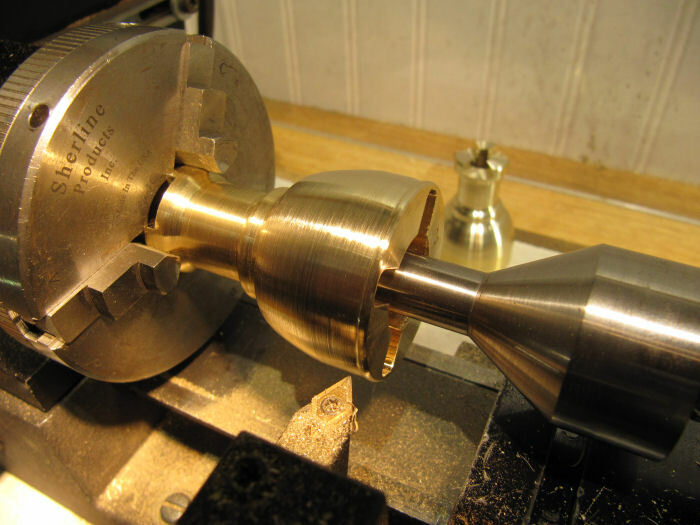 And the first long U-joint shell is turned to shape on the outside (except for the lip at the large end, that will come later). 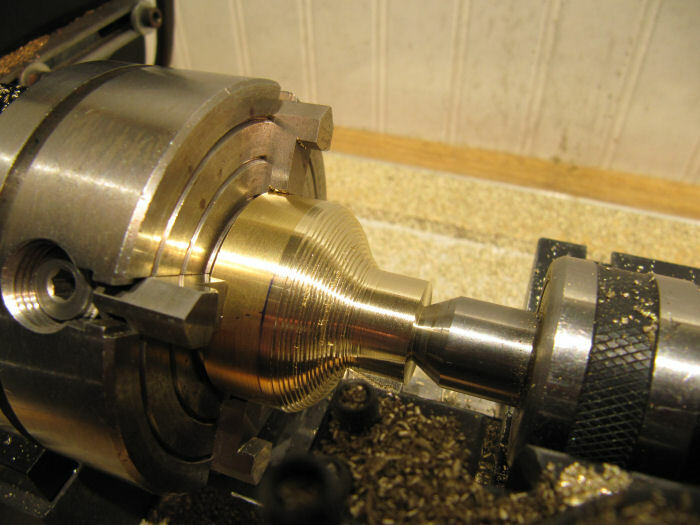 Next it needs to switch over to the mill to cut the teeth for the dog-clutch-type end plate. Not sure what to call it, since it really isn't a clutch in the normal sense. I still am not sure why they used the seperate dog clutch piece, which I assume has a keyway of some sort, at least a pin it rides on, and did not just put a key for the upper end to slide on. Maybe we're over-thinking this dog clutch thing. Maybe the answer is simply that they didn't have a collar in the size required by the shaft but they already HAD a dog clutch in the proper size so they used it? You know how the Parts Department loves it when one spare part can be used in a multitude of places. I think you're right about the keyway, I'd think that this whole assembly would have to be keyed to the shaft. You'd want as much surface area driving this beast as possible. Wouldn't a single pin hitting in the same spot all the time cause un-due stress and wear at that point? It would after all have to take the stresses of moving the whole machine. Thats very possible, the clutch jaw end is about the same size as the actual clutch, just the back end is long and a cylinder rather than short with a slot. Could well be the mould maker looked at the design and said, I have half that pattern already. They did all thier own parts castings. Also, probably easier to mould or machine a short keyway than one in the huge shell. Though, there must be a partial keyway or a full recess in the end shell, to let it slide back a few inches to clear the drive posts. This is a part I wish I could see inside. 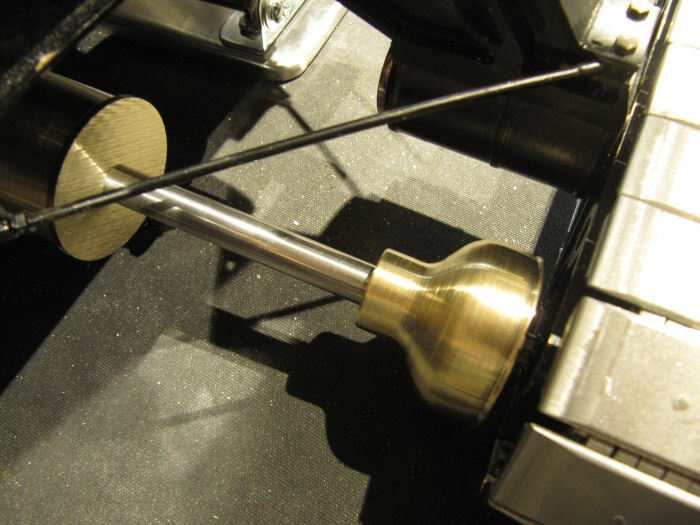 There is no diagram in the patent papers for this shaft. I think I will make the small clutch end with a keyway, the large part with a recess to let it slide down. It is the best I can come up with without dismantling the tracks, and the historical society would bury me in the quarry if I tried! Edit: looking at the pics again, there IS a collar below the clutch piece as well. Maybe they had a keyed clutch end and a stop collar with a set screw? Also could be another place that went through changes as they prototyped it. Just like the track frames, which still have bearing holes for the original patent outboard chain drives. Beyond words. I will have to get a length of cloth to wrap around my head so my jaw won't drop. I use a bungie cord for your dioramas! I think I will make the small clutch end with a keyway, the large part with a recess to let it slide down. Your solution would probably be the simplest. When you say the large part, are you talking about what you called the shell? Why put a recess in it? Just slide the dog clutch back, pop the key out and slide everything else back - EASIE-PEASIE. That way you don't take the chance of turning the shell into a paper-weight. From the picture it looks like the shell might be floating around on the shaft anyway, there is a gap between it and the dog clutch. 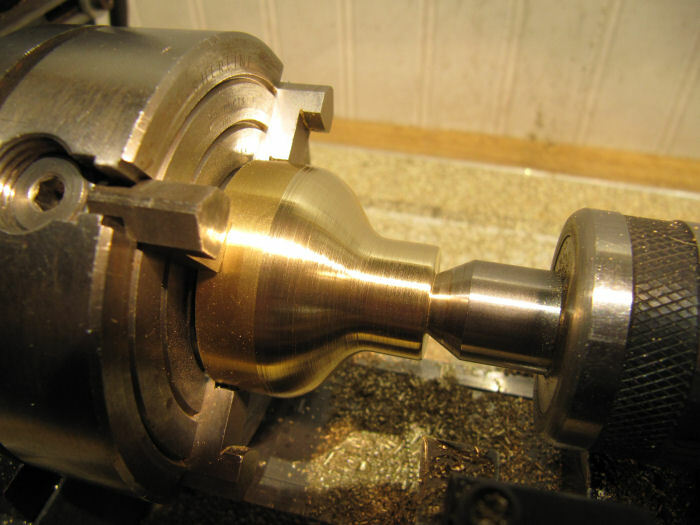 When you think about the equipment that they would have had available to build this thing back in the day, it would have been MUCH simpler to use a shaper to machine a keyway into a short-ish dog clutch than it would be to try that same trick on the much longer shell. There's probably a trapped key somewhere under the dog clutch. A horizontal mill could have been used to machine the keyway in the shaft. Vertical mills didn't really come into widespread industry use until the late 30's to early 40's or later, did they? You don't happen to have any more pictures of that drive shaft do you? Maybe it's time to send the Ninja elves out on a midnight mission to x-ray this beastie. Don, thats a neat idea. It would save undercutting the big shell, and a snug but not press fit would surely do the job. None of the photos show the internals on the joints, but I will be definitely taking a closer look when I get in to do the Christmas lights. The elves broke thier portable xray machine checking out their presents. Sheesh! Quite a snowy day out there today, just a couple inches here, upwards of a foot the other side of town along Lake Ontario (warm lake, onshore breeze, always makes for quick dumps of a lot of snow around here). So, great day to stay in the shops and play! 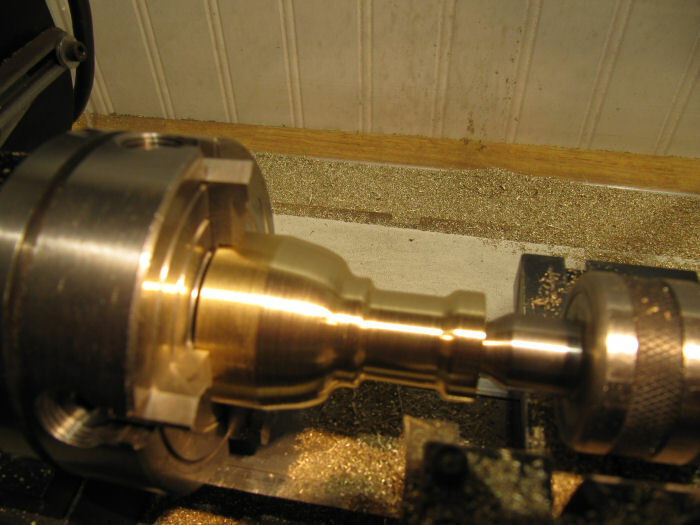 After finishing up both shells to the same point, switched over to the 3-jaw, reversed the part, held the outer end with the live center (the long 'billiard turning' center Sherline has now is handy for reaching over the slide and into recesses), and turned the bead on the large end. 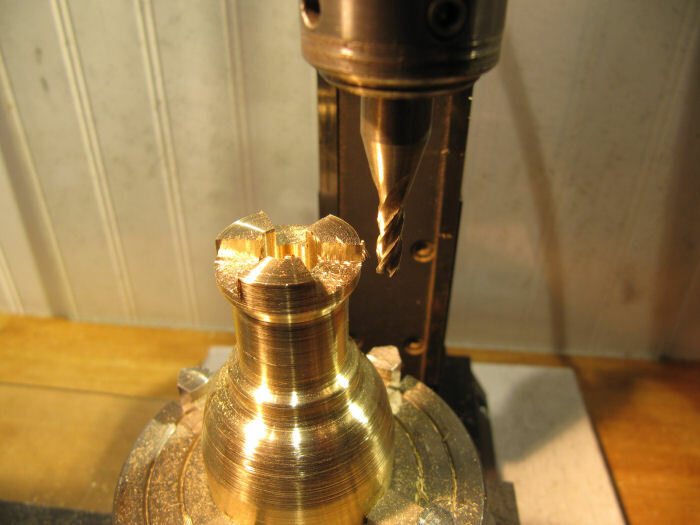 Then could smooth the curves at the big end, now that it is away from the chuck. Here are the parts so far, trial fit on the model. So far so good! Next up will be to make the dog and keyways. I think I will put a key on the smaller outer end as well, that will have a lot of torque on it. Looking great Chris. You'll have the shovel moving under power in no time. 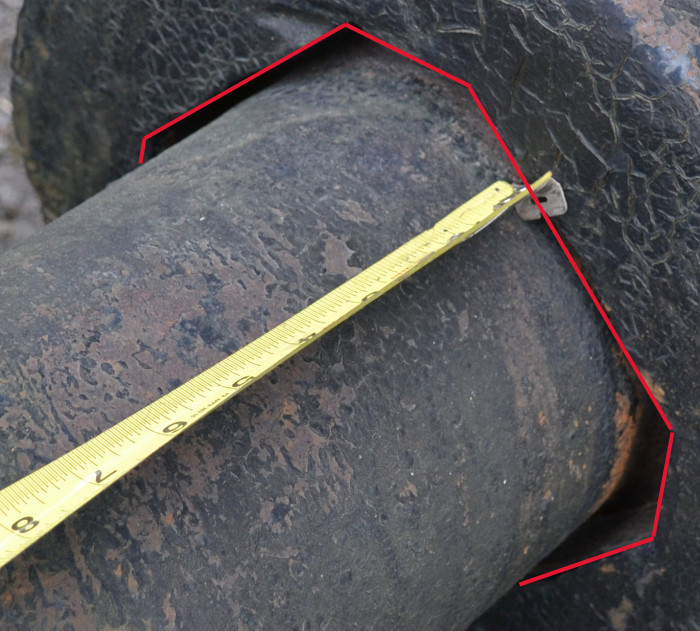 One more tidbit on the drive shaft dog fitting - I have been combing through the thousands of photos I have of the shovel from the different measurement trips I've made, and did find one more detail. Amazing how there is always one more angle that I wish I had taken a picture from. On the left is the small end of the inboard U-joint shell, to its right is what I have been calling the dog clutch piece, and on its right hand end is the stop collar with a square headed bolt acting as a set screw to hold the collar in position, which holds the other parts up the shaft. Unfortunately, I do not have a single photo, of the gazillion I took, looking straight down the slight gap in the dog area! Grrrr! Next time out will definitely get that, maybe see if my borescope can see more, at least some photos looking down it to see what that portion of the shaft and fitting looks like. 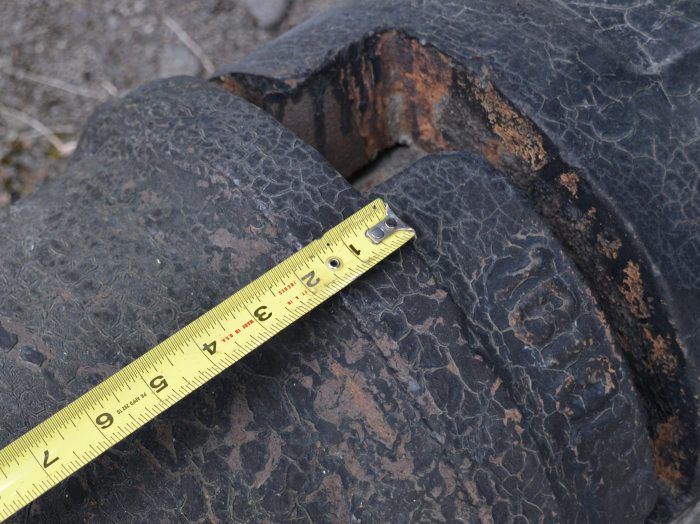 My best guess now is that the shaft would have one or more keys, protruding flats, or maybe an 8-sided section forged into it that the dog fitting slides on, but round where the u-joint shell is. 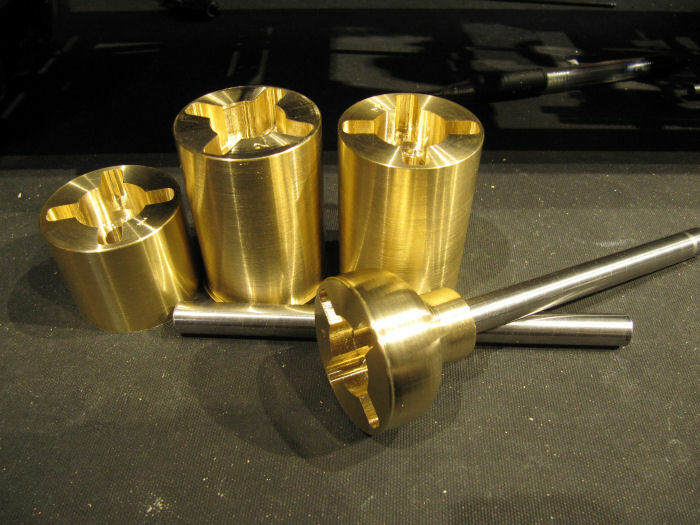 The stop collar could be released and slid back to allow the dog and shell to slide down enough to install the drive shaft onto the posts on the shaft coming out of the gearbox. Then they would be slid back up the shaft, and the stop collar bolt tightend down to hold it all in place. The flats on the shaft would make the dog turn, which would turn the shell. For the model, making that 8-sided section would be interesting - think for now I will try it with a removeable key like Don (ddmckee54) suggested. Hopefully I hear back soon on getting access to get the lights put up, will definitely be taking a camera too! !